Shadow is a smaller guy that raced at just 66lbs. He is very handsome with an unusual color- pure white except for some light fawn freckles in his coat. He gets along well with the other dogs small and large in his foster home. He is already home acclimated and has perfect manners. Shadow was initially placed when he was a young guy right off the race track. He was with his first home until he was 9. He was rehomed at that point. Shadow recently was turned into a shelter in horrible condition. 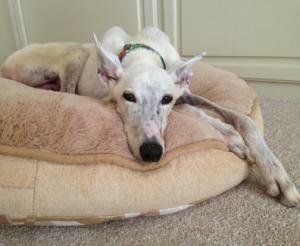 He weighed 44lbs (more than 20lbs under his racing weight) and was too weak to walk. We aren't sure what happened to him since he was adopted 3 years ago except that he definitely hasn't been getting enough to eat. When we adopted Shadow out he was a sweet, happy, loving boy that didn't act his age - 9 at the time. He loved to play and interact with the people and was literally a shadow following his people around and laying at their feet. Perfectly behaved, perfect manners and a dog people dream about owning. He was adopted as a companion for a handicapped child. We have no idea how he ended up in a shelter in another town quite a distance away in such horrible shape. Shadow will turn 13 June 3rd. Most of the photos we have posted of him are old ones from when he was 9 because of the condition he was in when we got him. Just the photo on this page is current and it was taken a few weeks after he arrived. Update 3/26/13: Shadow had a checkup at the vets today and the news was not good. Shadow's kidneys suffered from the starvation and are shutting down. He is not doing well so we have to help him cross the bridge. His foster home decided to officially adopt him so he would be someone's dog when he passes.